At SUBCOE we understand that the control exerted over the quality of the electric power feeding the motor system may have a big impact on your business. Our SUBCOE EnerLINE direct-on-line and soft starting switchboards are built to meet CSA standards so you will receive years of uninterrupted reliable service. Our CUBE motor controller is integrated to give digital control over the vacuum contactor starter to provide full monitoring and alarming based upon the real time three phase voltage, current, frequency and power factor values. The CUBE directly monitors the medium voltage output to provide near instantaneous short circuit protection for your valuable submersible pump motor. 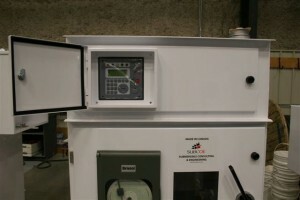 The SUBCOE EnerLINE switchboard may be used with any motor regardless of manufacturer or type. As a standard the board comes complete with fused disconnect switch, vacuum contactor, current limiting fuses, optional amp chart recorder, instrument and control transformers, rogowski coils (current), lightning arrestors, control switches, push buttons, pilot lights.